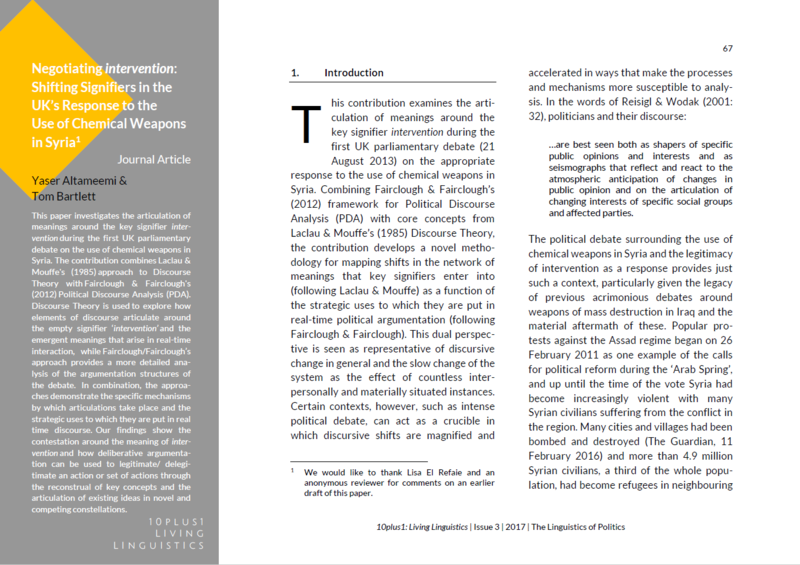 This paper investigates the articulation of meanings around the key signifier ‘intervention’ during the first UK parliamentary debate on the UK response to the use of chemical weapons in Syria (29 August 2013). The contribution combines Laclau & Mouffe’s (1985) approach to Discourse Theory with Fairclough & Fairclough’s (2012) Political Discourse Analysis (PDA) of argumentation structure. Discourse Theory is used here to explore how elements of discourse articulate around the empty signifier ‘intervention’ and the emergent meanings that arise in real-time interaction. While this approach brings to light the range of meanings that are articulated, Fairclough & Fairclough’s approach provides a more detailed analysis of the argumentation structures of the debate to demonstrate the specific mechanisms by which these articulations take place and the strategic uses to which they are put in real time discourse. Our findings show the contestation around the meaning of ‘intervention’ and how deliberative argumentation can be used to legitimate/delegitimate an action or set of actions through the reconstrual of key concepts and the articulation of existing ideas in novel and competing constellations. We argue, therefore, that combining these two approaches helps us to understand “why social realities are as they are, and how they are sustained or changed” (Fairclough & Fairclough, 2012: 79). Tom Bartlett is Reader in Language and Communication Research at Cardiff University. His main research ares are Systemic Functional Linguistics, Critical Discourse Analysis and Discourses of Development. His publications include Hybrid Voice and Collaborative Change: Contextualising Positive Discourse Analysis (Routledge, 2012) and Contesting Key Terms and Concepts in the Civil Sphere. In Peter Garrett and Josep Cots (Eds) The Routledge Handbook of Language Awareness (Routledge, 2017; with N. Montesano Montessori and H. Lloyd).